From solar eclipse mania to Hollywood intergalactic blockbusters, space exploration is back in the mainstream and makes a perfect STEM connection! While slightly biased as aerospace engineers, we find that the night sky and the drama of space exploration has universal appeal for all children. Through running an afterschool Space Club program, I find that students really connect to the excitment of a rocket launch or the possibilities of a colony in space. I explore this deeper in a blog post about how teaching space can inspire youth. 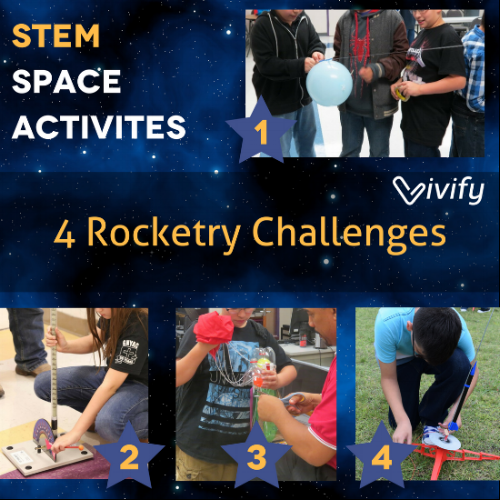 Ready to launch your students into some space STEM activities? 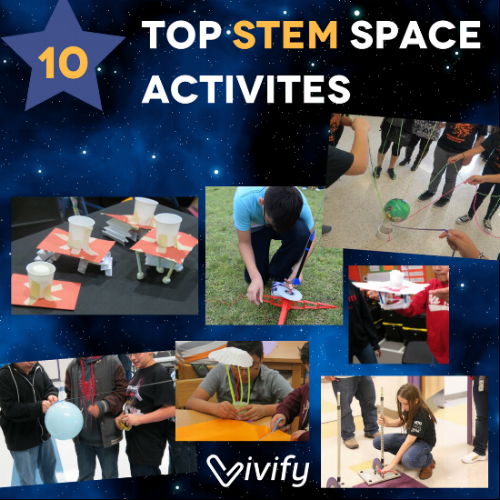 Explore our top 10 space-themed STEM activities categorized into the 3 stages of STEM to fit any learning level. Space exploration is all about teamwork. Each NASA rocket launch takes years of work and hunderds of scientists and engineers working as a team. This ensures that a safe and reliable rocket is built to hurl humans into space! Once on the International Space Station (ISS), astronauts must work together to survive the hazards of space (just watch any space movie). But do you know how astronauts move from their rocket to the ISS? A pilot carefully navigates the space vehicle to a docking port. Check out this video of SpaceX docking to the ISS. To simulate this maneveaour, our students complete the Space Docking Challenge. As shown below, 8 students work together to move a PVC ring with a ball balanced on top (the astronauts) to lock with a larger ring (the ISS) placed on the ground. This activity is easily adaptable by increasing the lenth of string, size of ball, or distance to the larger ring. We've done this activity with ages ranging from preschool to adults! This challenge is a big hit during our STEM Family Nights, and you can find instructions in our planning guide. Drill 8 evenly spaced holes into a 3 inch PVC adapter (some stores will even drill the holes for you). Attach a 5 foot polypropylene cord or similar rope to each hole. Burn ends to prevent fraying. Use a 4 inch PVC adapter for the ISS resting on the floor. Find a playground ball: the larger and heavier, the easier the challenge. During stage 2, students apply math and science concepts to solve an engineering problem using technology. The engineering design process is central to these challenges, which are often completed over several class periods to cover planning, building, testing, and reflecting. Balloon rockets: Attach a balloon to a straw and release on a string. How much air is required to get the balloon across the room? Little ones always get a kick out of this experiment. We upped the challenge for middle school by asking students to design a device that pops a balloon on the other end. Find our full challenge here. Straw Rockets: Using an air-pressured launcher, students design and build a rocket from a straw, modeling clay, and index cards to maximize distance. Challenge the students to think about aerodynamics, forces of flight, and stability to optimize the design. Find the full challenge here that incorporates engineering design with physics principals. Bottle Rockets: For a more advanced air rocket, students can launch plastic bottles filled with water to over a 100 feet! We incorporated the classic egg drop challenge where students had to design a recovery system to slowly bring back their rocket to keep the egg payload safe. We used the Pitsco rocket launcher and the Estes altimeter for tracking altitude. Model Rockets: Take rocketry to the next level by building and launching a model rocket kit! From a 10 minute assembly to hours of cutting and painting, kits for various skill levels and time constraints are available. Or apply the design process to a 3D printed rocket that can travel 100s of feet into the sky. Note: Safety is important! Read about safey regulations and use common sense such as never launching during a thunderstorm or within close proximity to an airport. Lunar Crater Challenge: Students manipulate the forces of motion to place a ball in a cup at the center of a 6 foot diameter circle without entering the circle. A great connection to space exploration, this engineering design challenge represents placing a NASA rover into the middle of the Apollo lunar crater to explore it as a potential human colony site. View the full challenge here. 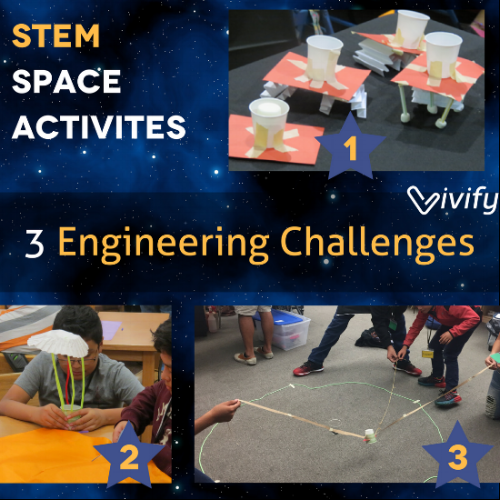 Space Lander Challenge: We recently featured this activity as one of our best STEM challenges ever because of the combination of science principles, a fun storyline, simple materials, and use of the design process. In the space lander challenge, Student teams build a lander to keep two marshmallow "aliens" inside a cup as it is dropped from various heights. Using straws, index cards, and mini marshmallows, students apply concepts of shock-absorption, drag forces, and stability, to create and test their designs. Drag Device Challenge: Without the mess of an egg drop challenge, students build a device to keep a ping pong ball inside their rover during impact. Exploring the forces of gravity and air resistance, students design a drag device to slow down a payload while learning how engineers land rovers on other planets like Mars. Find more details on this challenge here. Team America Rocketry Challenge: Compete with teams across the world on a rocket-twist to the egg-drop activity at the Team America Rocketry Challenge. A handbook is provided to guide students through physics principles and rocketry basics, but be prepared for intensive hands-on building. You may considering starting with basic model kits before progressing to this challenge. Mars Colony Competition: In Space Club, we developed our own multidisciplinary competition. Students apply scientific concepts, math skills, critical thinking, research, and engineering design to plan a long term habitat on Mars. Students consider both engineering and mental health aspects, and answer questions like: How will colonists get food? What is the Martian environment like? Will our colony have a government? How do we prevent boredom? In the end, students present research and protoype to local professionals. Implement this project in your program with our detailed guide. For a bonus space activity, check out our Space Math Activity Bundle. Students apply algebra to the threat of an incoming asteroid or design a safe shelter using geometry. 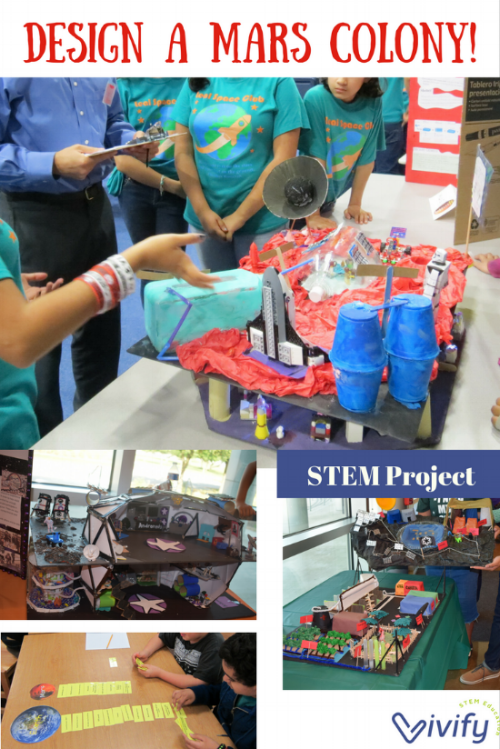 How do you incorporate space into your STEM classroom?